and wait… and wait … and wait again. 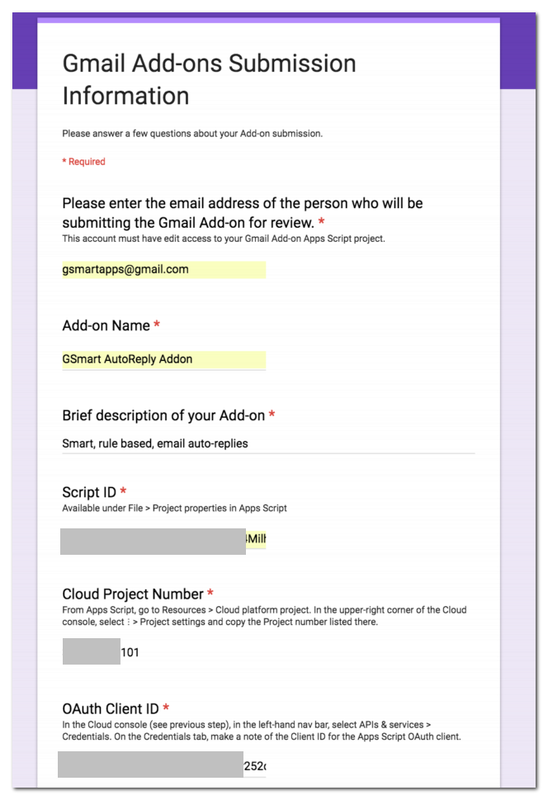 When I faced bugs while submitting the GSmart AutoReply Addon to the Market place, the first question I received was whether I had submitted the Gmail Addon pre-approval form. So, apparently, that form is very important. I had submitted the “Gmail Addon pre-approval form”; however all that it does its to collect the data and say sort of “Thanks, Bye.”. No response or follow-up or not even a reference number to keep track of. 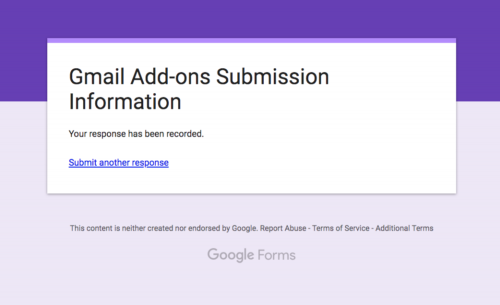 So I decided to submit the form again and document the entries and the response here so that at least I will be sure that I had submitted the form! May be I can use this post as a reference. The first page is primarily copy & pasting the different IDs. Now that all the info is filled out, let us submit the form and expect drum rolls welcoming another new developer to the Gmail kingdom. After all, this entire Gmail Addon paradigm is to evolve Gmail in to the next better email, right? Nah! OK; so what next? Go home boy. We’ll let ya know. I did not get any response or reply. I gave up on the Gmail Add-on part. It is just a waste of developer time. On the other hand, publishing add-on for other applications (like Google Sheets) is working. Man, I am having the same problem; it’s very frustrating. 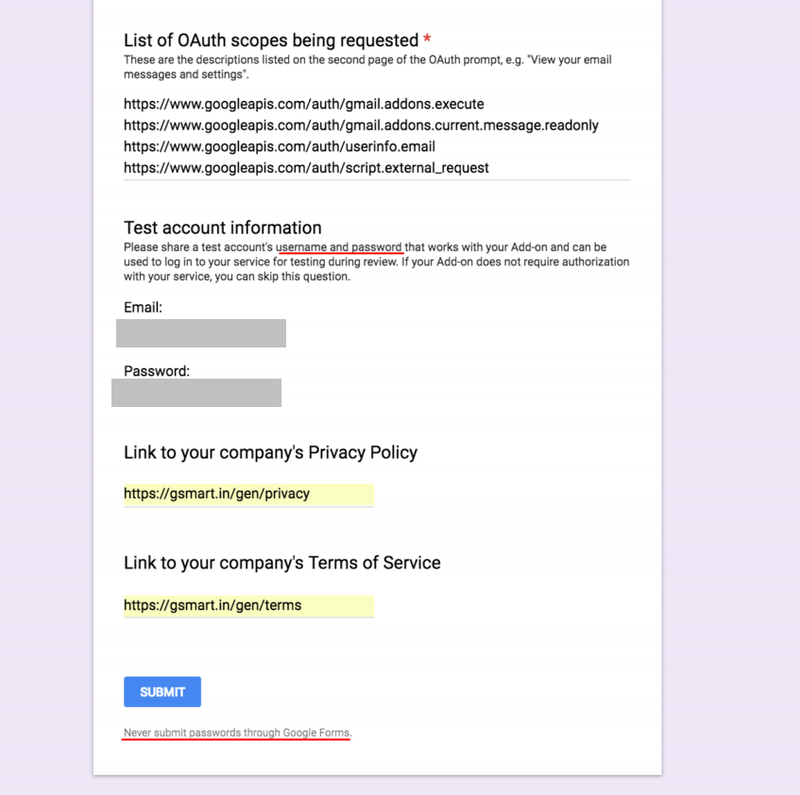 After investing so much time pouring through Google’s opaque documentation and eventually finishing a functioning product, they don’t even have the courtesy to email a receipt re pre-approval. Hope you get an update from them soon!